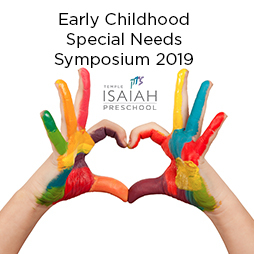 The special needs symposium is a series of lectures on various topics in early childhood special education including Speech and Language Development, Anxiety, Giftedness, and Young Learners, Sensory Processing Disorder and Autism. The lectures are designed to inform and provide tools for Early Childhood Educators, parents and other professionals who work or are interested in working with young children. Each lecture is led by an expert in their field with years of experience supporting children with special needs and their families. Each lecture will cost $25. Purchase three or more in the series, and the cost is $18 per lecture. Wednesday, April 10, 2019 | 6:00 p.m. to 9:00 p.m.
Wednesday, May 1, 2019 | 6:00 p.m. to 9:00 p.m.
Wednesday, May 15, 2019 | 6:00p.m. to 9:00 p.m.